The Porch - All Things Pearl Jam: Made In America Festival line up finally announced with dates! 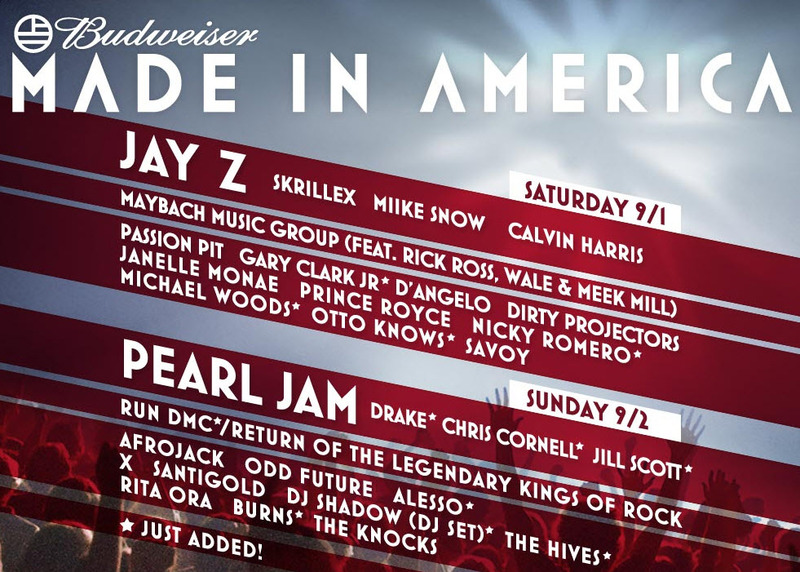 Made In America Festival line up finally announced with dates! It's official! Pearl Jam plays on Sunday September 2nd at the Made In America Festival in Philly! As an added bonus, Chris Cornell will be playing before him. Anyone seeing Hunger Strike in our future? Now that the date has finally been announced we can also confirm that the Pearl Jam Fan Wishlist Pre Party will definitely be on Sunday as well. Click here for more details on the party. I'm working hard getting it organized and it is going to be awesome! Can't wait to see everyone there. Yes! Finally! :)) I guess we will see you at the Pre-show & After show as planned! Thank you for all your hard work.